The cyclical nature of commodities and equities goes back at least until the 1970’s. When commodities are doing well, equities are performing poorly. Then the cycle flips and investors pile into equities, eventually making them expensive and commodities like gold and silver become cheap. But what do you get when you take the extremes of both equities and commodities? The extreme side of equities, technology stocks (NASDAQ Composite) being driven by lines of code you can’t touch. On the opposite end of commodities, you get tangible precious metals, silver and in particular gold. 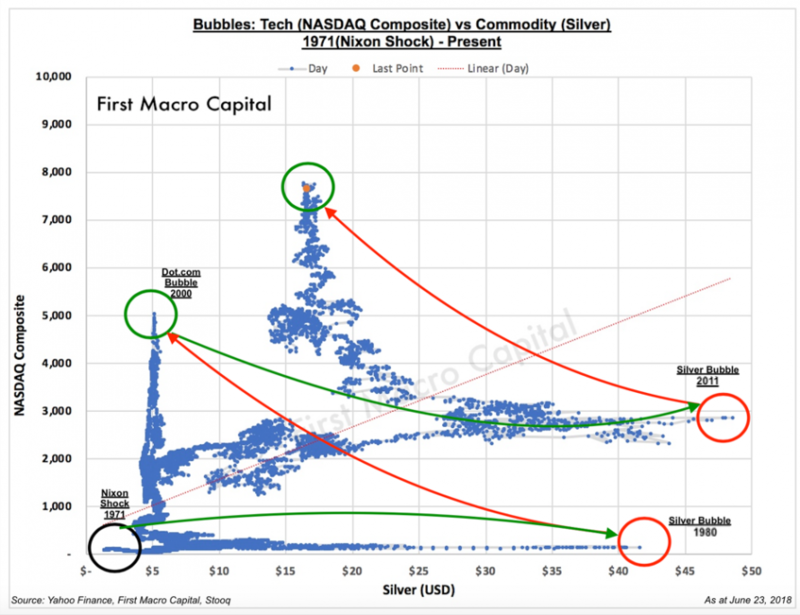 Tech investors versus gold and silver couldn't be more different. Their history of being at a tug-of-war has rarely been discussed until now. When we look at the NASDAQ Composite (NASDAQ) in relation to gold and silver in US dollars, going back to 1971, when the Nixon shock occurred. You get a striking relationship that confirms the cyclical nature between the commodities and equities. This was four years before Paul Allen and Bill Gates read the famous popular mechanics issue highlighting the world’s first microcomputer kit. That magazine propelled the creation of Microsoft. The 1970’s were a period of rising commodity prices, high inflation, a stagnant economy, and multiple recessions. 1971 – 1980: Commodities went on an epic bull run, increasing by more than twenty-five times, clearly outperforming the NASDAQ. 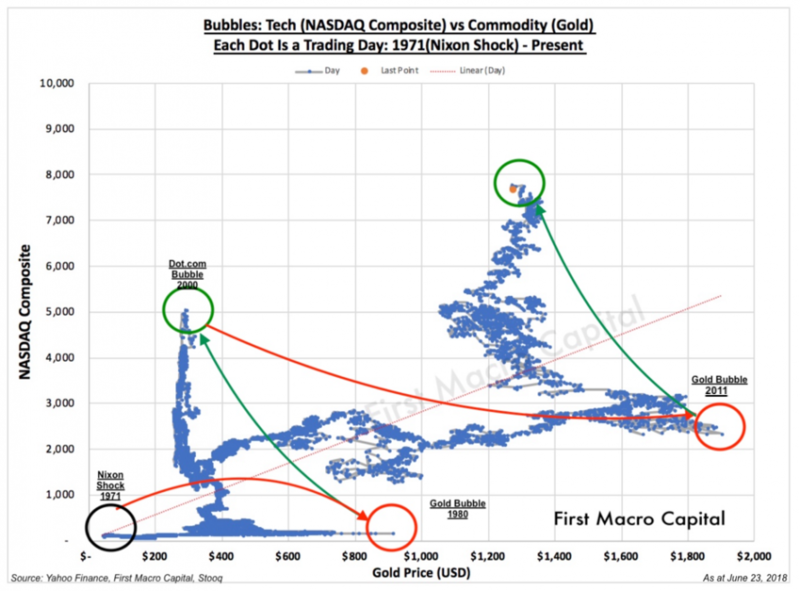 By 1980, the NASDAQ was incredibly cheap relative to gold and silver. 1980 – 2000: From 1980 onward capital flowed out of gold and silver and the overall commodities complex. as interest rates lowered, and confidence in the public sector was renewed. Equities were the cheap asset class in relation to commodities. This then set up the bull run in technology with the NASDAQ peaking in 2000. Gold and silver by this time were incredibly cheap to the NASDAQ. 2000 – 2011: The cycle rotated back to gold and silver until they peaked in 2011. This is in contrast to the S&P/GS Commodity Index (GSCI), that peaked in 2008. For gold and silver investors that followed the GSCI, they would have sold out early, as gold almost doubled about three years later in 2011. 2011- Today: Investors could have rotated into the NASDAQ in 2011, when gold and silver peaked in 2011, as NASDAQ has since almost tripled. Today, both gold and silver are incredibly cheap to the NASDAQ. Today, silver may bounce around, but it will be small moves in relation to the coming years assuming, that just like the past four cycles. This fifth cycle will swing back to silver and gold and we expect them to outperform the NASDAQ on a multi-year basis during for the fifth rotation. This back and forth pendulum swinging between the two, confirms the cyclical nature between equities and commodities, but at their extremes. As the NASDAQ pushes ahead while the S&P 500 languishes we are experiencing an accelerated melt-up. Is the blow off-top going to be driven by technology because of the famous FOMO? It doesn’t have the same sensations of Bitcoin in 2017 or the Dotcom bubble yet. 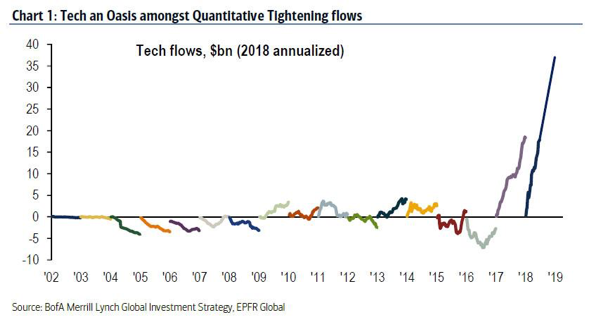 But as investors rotate out of Dow components because of trade concerns and into the asset light, businesses you end up at technology stocks. Was Paul Tudor Jones referring to tech stocks? The US economy continues to be strong, with the underlying ISM Manufacturing PMI at 58.7%, and the US ISM NON-Manufacturing PMI 58.6% for May. No, a recession isn’t in the cards yet. But we sure are getting close as the QE experiment is in tightening mode, and central banks are raising rates around the world. For the remainder of the year, it is still quite possible the NASDAQ could go higher, as the NASDAQ is still hasn’t experienced its phrase transition relative to gold and silver. Based on past cycles, there was always a melt-up and outlier for gold, silver, and the NASDAQ. Will the NASDAQ repeat history? With global central bank liquidity decreasing, increasing rates, and the ever-increasing tariffs, maybe it won’t break through the highs in 2002. Investors should reduce expectations to generate the same returns on a multi-year basis going forward as the past five years. For gold and silver investors, this is a massive long-term opportunity. Once the NASDAQ peaks, capital will flow to commodities, setting in the new trend for the commodities boom. From an investors perspective, on a multi-year basis, the reward is clearly to gold and silver, the downside risk clearly to the NASDAQ. Tech investors will swear they will never own commodities. But do you want to continue the streak after the tech boom? An investor does not need to be precisely right, but just approximately right over multiple years to take advantage of this gold and silver opportunity. Taking a multi-year view and not shorter-term view, silver and gold are incredibly cheap right now and they stand to benefit from the capital outflows from technology based on the cyclical rotation that has historically occurred. We are only in the first inning or two for gold and silver, particularly when you look at the where the NASDAQ is today. In all three booms that occurred between the NASDAQ Composite, gold, and silver, there was a melt-up higher for each of them. But the bottom may have already been set in 2016. What is in favor today (Technology) will soon be out of favor in the future, and what is out of favor today (Silver & Gold) will become in favor tomorrow. High-quality businesses with exposure to gold and/silver will give investors an edge to massively outperform the commodities complex and in particular the NASDAQ Composite on a multi-year basis. Following the Bloomberg Commodity Index is not bulletproof particularly for tech and precious metals investors. Precious Metals will outperform the technology sector over the next 5 years because the technology sector is peaking. We will be hosting a Live Webcast on Tuesday, July 3, at 4:20 PM ET. Mr. Paul Farrugia (President & CEO) will be discussing an unconventional approach for gold and silver investors in the coming commodity cycle.